A few months ago I was honored to speak at the prestigious SALT investment conference in the US city of Las Vegas. It had been quite a while since I’d been to Las Vegas. The activity and energy of the place really surprised me, even though I don’t gamble. Las Vegas was once the casino capital of the world, but Macau, a special administration region of China, has held that title for a number of years now (at least when it comes to gambling revenue). It was interesting to compare the two entertainment meccas and how they’ve evolved. On the night of my arrival after checking into my (crowded) hotel, I took a walk on the section of Las Vegas Boulevard known as “the Strip.” I was in good company; throngs of people were also out and about. I immediately called my colleague Jordan Pong, who is based in Hong Kong. Jordan is our entertainment analyst and covers the casinos in Macau, China, and other related companies in the region. The 2007–2009 global financial crisis and recession hit Las Vegas hard, and its economy had suffered. But by the looks of things more recently, I assumed Las Vegas casinos today must be making a fortune at their gaming tables and slot machines. Jordan told me that wasn’t actually the case. Macau still brings in more money than Las Vegas. He gave me some interesting numbers. Las Vegas has about 150 hotels with a total of about 132,000 rooms (150,000 if you include motels), while Macau has roughly 75 hotels with about 35,000 rooms.1 So Las Vegas has more hotels, and they are also larger than Macau. The variety of entertainment offered in Las Vegas far surpasses that of Macau—which I can personally confirm. During my short stay in Las Vegas, I took in two shows packed with enthusiastic, high-paying crowds—Britney Spears and the legendary British pop group Duran Duran, popular in the 80s and early 90s. In every hotel on the Las Vegas Strip there was at least one show and often more than one—there seemed to be something for people of all ages and tastes. As I walked down the Strip I would see advertisements for many other shows at area hotels as well, from comedy to music to magic acts. Our team is keenly interested in the consumer space in emerging markets and we have been exploring companies involved in leisure and entertainment, including tourism, for potential investment opportunities. It’s interesting to see the development of new theme parks, hotels, resorts and the like springing up in emerging markets—and how similar or different they are from those in developed markets. I recall my first visit to Las Vegas back in 1961. I was an experimental psychology student and teaching assistant at the University of New Mexico in the city of Albuquerque. One day some fellow students and I decided to drive to Las Vegas in an old car I had purchased for a few hundred dollars at a used-car lot. The drive to Las Vegas was supposed to be approximately nine hours, but it ended up being longer. We set off late in the afternoon, and when we reached the top of a mountain in the middle of the night, the car started sputtering. We had enough gas, but the engine gave a final spurt and then broke down. It was quite cold outside, so luckily we were able to coast down the mountain to a valley. We found a small town of probably just a few hundred people, but there were more than 500 cars parked. It looked like an automobile cemetery. Apparently, other drivers met the same fate we had at the top of the mountain, and had abandoned their cars. At an auto-repair shop, we asked if the car could be fixed. The mechanic knowingly looked at us and said yes, but it would cost US$600. The entire engine was frozen, something that apparently happened in that area because of an unusual combination of cold and high altitude. I decided to sell the car, but the mechanic said he didn’t want it, as there was a surplus of abandoned cars nearby already. He offered me $50 in scrap value for it, and my friends and I hitchhiked to Las Vegas. We arrived very late at night and we didn’t have enough money for a hotel room. We took a nap in one of the hotel lobbies and then proceeded to lose the rest of the cash we had in the casinos. That experience put me off gambling for life! We had to hitchhike back to Albuquerque. I took that fateful trip because I had wanderlust, which still stays with me to this day. At that time, Las Vegas had a glamorous and exciting image, even though there were far fewer hotels than there are today and fewer entertainment options. The city embraced its legacy not only as a major center for hard-core gamblers, but also evolved to become a major entertainment venue—one that today has many options for families, too. Macau’s history as a gambling center pre-dates that of Las Vegas, going back some three centuries. In the mid-1800s, Macau’s then-controlling Portuguese government officially made gambling legal. Today, Macau takes gambling very seriously. Unlike Las Vegas, Macau hasn’t been oriented as a tourist destination for those seeking other forms of entertainment, but there have been efforts to change that. After a string of years with lower revenue growth, there has been a push for Macau to take Las Vegas’ lead in diversifying its offerings to attract more visitors who aren’t solely focused on gambling. More resorts are being built, but there are some cultural and other challenges to more fully transforming Macau into a destination for tourists at large. Large US hotel/casino companies have been increasingly influencing Macau’s gaming industry though, bringing a new type of tourist experience. For example, one well-known US casino/hotel operator has built replicas of its Las Vegas entertainment properties in Macau, designed to give a guest the experience of being in an entirely different city. 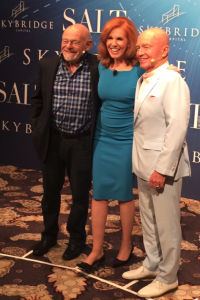 At the SALT conference in Las Vegas, with Sam Zell (left) and Fox Business Anchor Liz Claman (middle). During my recent visit to Las Vegas, I refrained from gambling (I learned my lesson long ago). I focused on my work and participated in the conference at which I was speaking. One of the highlights for me was appearing on stage with the great property developer and global investor Sam Zell. At the time I was reading his very interesting book “Am I Being Too Subtle?” So, meeting the author and speaking with him was a treat. To me, Las Vegas represents a glimpse of how many economies are shifting around the world. Automation, robotics, the Internet and artificial intelligence have transformed manufacturing. People are no longer required to do many of the repetitive tasks that machines and computers can now do. As such, human work has been shifting to revolve around services, including entertainment and hospitality. These are the kind of activities that dominate Las Vegas—and which many emerging economies are modeling. I think Las Vegas, Macau, and other entertainment centers offer a snapshot how economies are changing—and how consumer tastes and interests are, too. 1. Sources: Las Vegas Convention and Visitors Bureau; Macau Government Tourism Office; JP Morgan, data as of 2016. 2. Sources: Las Vegas Convention and Visitors Authority; Government of Macau Special Administrative Region. 3. Sources: Macau Gaming Inspection and Coordination Bureau; “Play Nevada,” Nevada Gaming Control Board; JP Morgan, data as of 2016. 4. Source: “Play Nevada,” Nevada Gaming Control Board, January 2017. 5. Source: Macau Gaming Inspection and Coordination Bureau.